Andre Drummond and Blake Griffin were vital to the Pistons dominating the Cavaliers 113-102. The Detroit big men combined for to score 44 points and grab 28 rebounds in the win. Collin Sexton had 18 points and 4 assists for Cleveland in the loss. Klay Thompson led the Golden State Warriors with 34 points against the Phoenix Suns resulting in the final score 117-100. Kevin Durant scores 34 points with 10 rebounds against his old team as the Warriors win on the road versus the Thunder, 111-107. Victor Oladipo scores 24 points and Thaddeus Young adds 17 with 10 rebounds, as the Pacers beat the Warriors on the road, 92-81. Stephen Curry throws the nice bounce pass to Zaza Pachulia for the for the layup. LaMarcus Aldridge dominated the court tonight with 33 points, 12 rebounds and one assist in his team's win against the Golden State Warriors resulting in the final score 89-75. Kevin Durant scores 26 points and adds six assists to help the Warriors knock off the Lakers, 117-106. FNTSY Sports Network breaks down the biggest NBA Fantasy performances from Sunday’s NBA slate. Karl-Anthony Towns goes for 31 points and 16 rebounds as the Timberwolves get a home win over the Warriors 190-103. Kevin Durant had 39 points and 12 rebounds for Golden State in the loss. Klay Thompson scoots a pass to Zaza Pachulia who hits the reverse layup while getting fouled. C.J. McCollum scores 30 points, Damian Lillard adds 28 as the Trail Blazers top the Warriors, 125-108. Grab a treat and fix your seat for Saturday's top ten plays from the NBA. After a drive by Russell Westbrook, Zaza Pachulia falls on Westbrook's leg. •Selected by Orlando in the second round (42nd overall) of the 2003 NBA Draft. •Selected by Charlotte from Orlando in the NBA Expansion Draft on June 22, 2004. •Acquired by Milwaukee from Charlotte in exchange for a 2004 second round draft pick on June 23, 2004. •Signed as a free agent with Atlanta on August 11, 2005. •Signed as a free agent with Milwaukee on July 17, 2013. •Acquired by Dallas from Milwaukee in exchange for a future second round pick on July 9, 2015. •Signed as a free agent with Golden State on July 12, 2016... Re-signed with Golden State on July 25, 2017. •Ranks sixth among active players in offensive rebounds (2,174, 64th all-time). •Has made over 70 percent of his free throw attempts in 12 of his 14 NBA seasons. •Appeared in 961 games (456 starts) over 14 seasons with Orlando, Milwaukee, Atlanta, Dallas and Golden State, averaging 7.0 points, 6.0 rebounds and 1.3 assists in 21.2 minutes while shooting 46.5 percent from the field and 74.8 percent from the free throw line. •Appeared in 66 postseason games (26 starts), averaging 5.2 points and 4.7 rebounds in 17.8 minutes. •Has scored in double figures 10 times. •Has grabbed double-digit rebounds six times. •Has tallied two double-doubles (both in the 2009 First Round). •Shot a playoff career-high 88.2 percent from the free throw line in the 2016 NBA Playoffs. •Swiped a playoff career-high six steals in Game 4 of the 2015 First Round on 4/25/15 vs. Chicago. •Scored a postseason career-high 16 points in Game 3 of the 2010 First Round on 4/24/10 at Milwaukee. •Made his first career playoff start in Game 2 of the 2009 Eastern Conference Semifinals on 5/7/09 at Cleveland, grabbing 12 rebounds and scoring seven points in a playoff career-high 35 minutes. •Collected a playoff career-high 18 rebounds to go with 12 points, the second double-double of his postseason career, in Game 4 of the 2009 First Round on 4/27/09 at Miami. •Secured the first double-double of his postseason career with 10 points and 10 rebounds in Game 1 of the 2009 First Round on 4/19/09 vs. Miami. •Made his NBA playoff debut in Game 1 of the 2008 First Round on 4/20/08 at Boston, scoring four points and grabbing three rebounds in 12 minutes. •Appeared in 70 games (all starts), averaging 6.1 points, 5.9 rebounds and 1.9 assists in 18.1 minutes while shooting a career-best 53.4 percent from the field. •Among centers in the NBA, finished the season with the highest plus/minus (+6.0). •Led the team in offensive rebounds (2.0) and total offensive rebounds (140). •Scored in double figures 14 times. •Scored in double-digits four consecutive times, a season-long streak (1/2-1/8). •Grabbed 10-plus rebounds 10 times... Collected double-digit rebounds in back-to-back games twice (11/18-11/19; 10/28-10/30). •Recorded his fourth double-double of the season with 10 points and 10 rebounds in 21 minutes on 3/16 vs. Orlando. •Tallied his third double-double of the season with 11 points and 12 rebounds in 20 minutes on 3/11 at San Antonio. •Scored a season-high 16 points to go with five rebounds, two assists and one block in 15 minutes on 2/27 at Philadelphia. •Recorded a career-high four blocks, including three in the first five minutes of the game, on 2/23 vs. the L.A. Clippers. •Connected on a season-high eight free throws on a season-high 10 free throw attempts while tying a season-high with four steals on 1/29 at Portland, finishing the game with 14 points. •Registered his second double-double of the season with 15 points and 14 rebounds in 26 minutes on 12/22 at Brooklyn. •Appeared in his 900th career regular-season game on 11/10 at Denver, tallying four points, four rebounds and a season-high four steals in 14 minutes. •Recorded his first double-double of the season with 10 points and 11 rebounds on 10/28 at New Orleans, tallying his first double-double since 3/25/16 with Dallas at Golden State (12 points and 13 rebounds). •Missed eight games due to a right rotator cuff strain (2/1-2/15)... Missed four games due to a right wrist contusion (12/10-12/15). •Appeared in 15 games (all starts), averaging 5.1 points and 3.8 rebounds in 14.1 minutes while shooting a playoff career-high 53.3 percent from the field to go with 76.5 percent from the free throw line. •Scored in double figures four times. •Made his NBA Finals debut in Game 1 of the NBA Finals on 6/1 vs. Cleveland, finishing with eight points, five rebounds and a 2017 postseason-high-tying two steals. •Tallied four points and two assists in seven minutes in Game 2 of the Western Conference Finals on 5/16 vs. San Antonio before leaving the game with a right heel contusion. •Scored a 2017 postseason-high-tying 11 points in Game 1 of the Western Conference Finals on 5/14 vs. San Antonio, recording his fourth double-digit scoring game of the postseason (10th career), to go with 2017 postseason-highs of nine rebounds and 26 minutes. •Finished with 10 points in Game 1 of the Western Conference Semifinals on 5/2 vs. Utah, tallying his third double-digit scoring effort of the 2017 postseason (ninth career)... Scored in double figures in back-to-back postseason games for the first time in his career. •Scored a 2017 postseason-high 11 points in Game 4 of the First Round on 4/24 at Portland, his eighth career double-digit scoring game in the postseason. •Scored 10 points in Game 2 of the First Round on 4/19 vs. Portland, his seventh career double-digit scoring game in the postseason. •Missed two games (Games 3 and 4 of the Western Conference Finals) with a right heel contusion. •Appeared in 76 games (69 starts), averaging 8.6 points, a career-high 9.4 rebounds and 1.7 assists in 26.4 minutes, shooting 46.6 percent from the field and 76.8 percent from the free throw line. •Among NBA leaders, ranked fifth in total offensive rebounds (249) and 14th in rebounds per game. •Finished fourth among Western Conference frontcourt players in All-Star voting with 768,112 votes, which was 14,227 votes behind San Antonio forward Kawhi Leonard for the final starting spot. •Scored in double figures 32 times. •Recorded a career-high 41 games with double digit rebounds and a career-high 11 games with 15-plus boards, including one game with 20-plus rebounds. •Tallied a career-high 26 double-doubles (all point/rebound), including 12 double-doubles in the team’s first 19 games of the season... Recorded three first-half double-doubles after he had two in his career prior to the 2015-16 season. •Collected his 22nd double-double in his 47th game of the season, giving him a new career-high for most double-doubles in any one season, tallying 10 points and 15 rebounds on 2/3 vs. Miami (previous high: 21 double-doubles in 78 games with Atlanta in 2005-06). •Recorded his 100th career double-double (20th of the season) on 1/12 vs. Cleveland, tallying 14 points and 12 rebounds in 32 minutes... Marked his 26th game of the season with double-digit rebounds, a new career-high for most games in a single season with 10-plus boards (previous: 25 times in 2005-06). •Grabbed his 5,000th career rebound at the 3:43 mark of the second quarter on 1/10 at Minnesota. •Matched a career-high with five steals to go with nine points and 17 rebounds in 40 minutes in a double overtime win on 1/5 vs. Sacramento. •Scored 14-plus points in five-straight games (12/26-1/2), marking the longest such streak of his career. •Tied a career-high with 21 rebounds (including a career-high 16 defensive boards) to go with 14 points on 12/1 at Portland... Tallied 10 points and 13 boards in the first half alone. •Handed out his 1,000th career assist at the 9:05 mark of the first quarter on 11/22 at Oklahoma City... Finished that contest with season-highs in assists (6) and blocks (3) to go with 12 points and 10 rebounds in 34 minutes. •Scored a season-high 18 points to go with a game-high 16 rebounds for his fifth double-double of the season on 11/13 vs. the L.A. Lakers, leading the team outright in points and rebounds in a winning effort for the first time in his 824-game career. •Recorded his 2,000th career made field goal with a hook shot at the 8:46 mark of the third quarter on 11/3 vs. Toronto. •In his Dallas debut, tallied a double-double with 10 points and 10 rebounds on 10/28 at Phoenix. •Missed four games due to a sore right Achilles... Missed one game due to rest... DNP-CD once. •Appeared in five postseason games (four starts), averaging 6.6 points, 5.4 rebounds and 3.2 assists in 22.4 minutes, shooting a playoff career-high 88.2 percent from the free throw line. •Tallied 12 points, seven rebounds and a playoff career-high nine assists in 32 minutes on 4/25 at Oklahoma City in Game 5 of the First Round. •Appeared in 73 games (45 starts), averaging 8.3 points, 6.8 rebounds, 2.4 assists and 1.10 steals in 23.7 minutes, shooting 45.4 percent from the field and 78.8 percent from the free throw line. •Scored in double figures 28 times and 20-plus once. •Tallied 15 double-doubles, his most in a single season since posting 21 double-doubles in 2005-06 with Atlanta. •Tied a career-high with five steals on 4/8 vs. Cleveland. •Recorded back-to-back games with 14-plus rebounds on 1/2/15 and 1/4/15 for only the second time in his career (first since 3/17/06 and 3/19/06). •Became one of three players to have a 10-point/10-rebound/5-assist/5-steal game in 2014-15 (LeBron James and Stephen Curry) and the first for the Bucks since Blue Edwards on 1/23/93. •Swiped a career-high five steals on 3/24 vs. Miami, tallying a double-double with 14 points and 11 rebounds to go with a season-high-tying seven assists. •Set season-highs in points (22), field goals (9), assists (7) and minutes (40) while setting career highs in rebounds (21) and offensive rebounds (18) for his first career 20/20 game in a triple overtime contest on 3/20 at Brooklyn, joining Dennis Rodman and Charles Oakley as the only three players since 1985-86 with 18 offensive rebounds in a game... Set a new Bucks franchise record for offensive rebounds in a game, surpassing Swen Nater’s 15 offensive boards on 12/19/76 vs. ATL. •In his first start of the season on 11/18 vs. New York, tallied his first double-double of the campaign with 14 points and 13 rebounds. •Appeared in six postseason games (all starts), averaging 6.7 points, 6.7 rebounds, 1.5 assists and 1.67 steals in 21.5 minutes. •Swiped a playoff career-high six steals on 4/25 vs. Chicago. •Appeared in 53 games (43 starts), averaging 7.7 points, 6.3 rebounds and a career-high 2.6 assists in 25.0 minutes, shooting a career-high 84.6 percent from the free throw line. •Scored in double figures 16 times and 20-plus once. •Grabbed double-digit rebounds seven times. •Collected a season-high 16 rebounds on 4/2 at Miami. •Tallied 17 points, 13 rebounds and four steals on 3/8 at Portland, marking only the second time in his career that he’s had a game with 15-plus points, 10-plus rebounds and four-plus steals (previous: 3/26/06). •Posted an eight-assist night on 3/24 at the L.A. Clippers to make him one of just three centers in the league to record multiple games with at least eight assists on the season (Marc Gasol and Joakim Noah). •Handed out a career-high 10 assists on 3/11 at Minnesota. •Opened the season by making his first 23 attempts from the free throw line, which stood as the best start by a Buck since Corey Maggette made 33-straight to open the 2010-11 season. •Suffered a right foot fracture on 12/4 vs. Detroit and missed 28 games. •Appeared in 52 games (15 starts), averaging 5.9 points, 6.5 rebounds and 1.5 assists in 21.8 minutes, shooting 47.3 percent from the field and 75.7 percent from the free throw line. •As a starter, averaged 6.7 points, 7.7 rebounds and 2.1 assists in 28.3 minutes while shooting 53.2 percent from the field. •Ended the season ranked seventh in Hawks history with 1,247 offensive rebounds. •Scored in double figures seven times. •Broke the Hawks franchise record for offensive rebounds in a quarter with seven offensive boards in the second frame on 2/23 at Milwaukee, finishing with 11 total rebounds (eight offensive) on the night. •Tallied 13 points, 11 rebounds and a season-high eight assists in 39 minutes on 1/16 vs. Brooklyn. •Scored a season-high 19 points and grabbed 12 rebounds on 11/24 vs. the L.A. Clippers. •Missed 30 games due to a right Achilles injury, undergoing surgery on 4/3 and missing the 2013 postseason. •Appeared in 58 games (44 starts), averaging 7.8 points, 7.9 rebounds and 1.4 assists in 28.3 minutes, shooting 49.9 percent from the field and 74.1 percent from the line. •Among NBA leaders, ranked 25th in rebounding and tied for 20th in offensive rebounding (2.7). •Scored in double figures 20 times. •Grabbed a season-high 20 rebounds and scored 15 points on 3/25 vs. Utah. •Scored a season-high 16 points on 1/27 at Detroit. •Did not participate in the playoffs due to a sprained left foot. •Appeared in 79 games (seven starts), averaging 4.4 points and 4.2 rebounds in 15.7 minutes, shooting 46.1 percent from the field and 75.4 percent from the free throw line. •As a starter, averaged 5.1 points and 6.1 rebounds in 23.1 minutes. •Scored in double figures 10 times. •Tallied a season-high 19 points and 10 rebounds on 3/16 vs. Denver. •Appeared in 11 postseason games, averaging 3.5 points, 4.9 rebounds and 1.2 assists in 17.7 minutes. •Appeared in 78 games (one start), averaging 4.3 points and 3.8 rebounds in 14.0 minutes, shooting 48.8 percent from the field. •Ranked fifth on the team in rebounds and third in field goal percentage. •Scored in double figures six times. •Recorded his lone double-double of the season with 10 points and 10 rebounds on 3/31 vs. the L.A. Lakers. •Tallied a season-high 14 points on 12/11 at Toronto. •Appeared in 11 postseason games, averaging 4.6 points and 3.5 rebounds in 14.6 minutes, shooting a postseason career-best 51.4 percent from the field. •Scored a postseason career-high 16 points on 4/24 at Milwaukee in Game 3 of the First Round. •Appeared in 77 games (26 starts), averaging 6.2 points and 5.7 rebounds in 19.1 minutes, shooting 49.7 percent from the field and 70.9 percent from the free throw line. •Scored in double figures 15 times. •After shooting just 32.2 percent from the floor in November, shot 58.6 percent in December, 55.0 percent in January, 51.8 percent in February and 56.9 percent in March. •Scored a season-high 18 points on 1/20 at Chicago. •Grabbed a season-high 18 rebounds on 11/19 vs. Washington. •Appeared in 11 postseason games (one start), averaging 6.9 points and 6.9 rebounds in 23.6 minutes. •Made his first career playoff start on 5/7 at Cleveland in Game 2 of the Eastern Conference Semifinals, grabbing 12 rebounds and scoring seven points in 35 minutes. •Collected a postseason career-high 18 rebounds to go with 12 points on 4/27 at Miami in Game 4 of the First Round. •Appeared in 62 games (five starts), averaging 5.2 points and 4.0 rebounds in 15.2 minutes. •Recorded a season-high 14 points four times (11/16 vs. Seattle; 11/28 vs. Milwaukee; 2/25 at San Antonio; 4/16 at Miami). •Appeared in seven postseason games, averaging 4.1 points and 2.9 rebounds in 15.0 minutes. •Tallied nine points, six rebounds and two steals in 28 minutes on 5/2 vs. Boston in Game 6 of the First Round. •Made his NBA playoff debut on 4/20 at Boston in Game 1 of the First Round, scoring four points and grabbing three rebounds in 12 minutes. •Appeared in 72 games (47 starts), averaging a career-high 12.2 points, 6.9 rebounds, 1.5 assists and 1.07 steals in 28.1 minutes, shooting 47.4 percent from the field and 78.6 percent from the free throw line. •Scored in double figures 47 times and 20-plus 11 times. •Scored a career-high 27 points to go with 12 rebounds and three blocks on 3/7 vs. Washington. •Appeared in 78 games (all starts), averaging 11.7 points, 7.9 rebounds, 1.7 assists and 1.14 steals in 31.4 minutes, shooting 45.1 percent from the field and 73.5 percent from the free throw line. •Among NBA leaders, ranked third with 3.4 offensive rebounds per game and fifth in total offensive rebounds (264). •Scored in double figures 51 times and 20-plus three times. •Pulled down a season-high 12 offensive rebounds on 3/19 vs. Orlando, finishing the game with 18 total rebounds. •Scored 26 points to go with nine rebounds and four assists on 3/15 at New York. •Appeared in 74 games (four starts), averaging 6.2 points and 5.1 rebounds in 18.9 minutes, shooting 45.2 percent from the field and 74.6 percent from the free throw line. •Recorded a season-high 15 points on 3/30 vs. Golden State. •Grabbed a season-high 13 rebounds on 12/8 vs. Miami. •Appeared in 59 games (two starts), averaging 3.3 points and 2.9 rebounds in 11.3 minutes. •Scored in double figures three times. •Made his first career start on 2/11 vs. Miami, grabbing three rebounds and dishing out two assists in 19 minutes. •Tallied a season-high 14 points on 2/4 at Toronto. •Made his NBA debut on 11/5 vs. Chicago, scoring seven points, grabbing six rebounds and swiping two steals in 16 minutes. •Played with the Georgian National Team for eight summers. •Competed for Georgia at Eurobasket in the summer of 2015, averaging 13.5 points, 6.3 rebounds, 3.0 assists and 1.0 steal in six games. •Signed with Galatasaray (Turkey) during the NBA work stoppage in 2011-12, but later returned to Atlanta in Dec. 2011. •Appeared in 73 games during parts of four seasons for Ülker of Istanbul in the top basketball league in Turkey, averaging 6.0 points and 3.8 rebounds (1999-2003). •Helped capture the 2001 and 2002 Turkish President’s Cup... Also helped Ülker to the 2001 Turkish National Championship. •Began playing for Ülker when he was just 15 years old in 1999. •Left his native Georgia in 1998 to go to Turkey and pursue his basketball career. •Member of the Georgian Junior National Team and the Georgian Cadets National Team. PERSONAL: Given name is Zaur Pachulia... 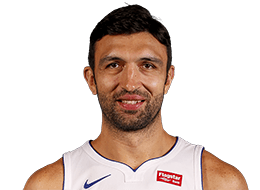 Legally changed his first name to Zaza... Born in Tbilisi, Republic of Georgia... Is the first player from the Republic of Georgia to win an NBA championship... Nickname is “Z”... Returned home to Tbilisi with the Larry O’Brien trophy and received the Order of Honor from Georgia President Giorgi Margverlashvili in a ceremony on August 7, 2017... A serious entrepreneur, has taken executive business classes at Harvard Business School in 2012, Georgia State in 2009 and 2011, and Northwestern in 2008... Took an active role politically when he spoke against the Russian invasion of his homeland in 2008... Has served as the Style Editor for HOOP Magazine… In conjunction with the U.S. Department of State, along with the NBA, Vladimir Stepania and Nikoloz Tskitishvili, has donated products to basketball academies in his home country... Hosted his first basketball camp in the Republic of Georgia in the summer of 2016 for more than 300 kids and is focused on growing his basketball academy in his native Tbilisi... Participant in the NBA’s Basketball Without Borders initiative and spent a portion of the summer of 2006 assisting in the Sarunas Marciulionis Basketball Academy in Vilnius, Lithuania... Threw out the ceremonial first pitch at an Oakland A’s game on September 23, 2016... Names Al Pacino, Robert De Niro and Sacha Baron Cohen as his favorite actors... Favorite sports outside of basketball include tennis and soccer... Fan of the AC Milan soccer team... Lists Jay-Z and 50 Cent as his favorite musical artists... Hobbies include traveling and fashion... Wears a size 17 basketball shoe... Enjoys eating steak and pasta... Favorite athlete is Michael Jordan... Played with the Georgian National Team for eight summers... Began playing for Ülker of Istanbul in the top basketball league in Turkey when he was just 15 years old in 1999... Left his native Republic of Georgia in 1998 to go to Turkey and pursue his basketball career.